The UK Sponsorship Awards Ltd manages The UK Sponsorship Awards events, The UK Sponsorship Awards website and The UK Sponsorship Newsletter. We co-manage Women in Sponsorship events with Think!Sponsorship. Provided when individual/company has registered to be sent more information on The UK Sponsorship Awards/entered The UK Sponsorship Awards/attended The UK Sponsorship Awards/sponsored/partnered/supplied to The UK Sponsorship Awards. Contact information has been sent with press material for publication. Contact has asked to be added to the database. 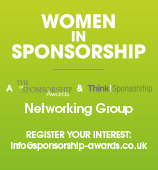 Contact has agreed or asked to be Linked In with Rosemary Sarginson, Managing Director, The UK Sponsorship Awards Ltd. If a financial transaction has taken place (awards entered or event attended), we will also hold company name and address. Any financial information is handled by our web payment gateway providers (Sage Pay and GlobalPay) and not The UK Sponsorship Awards. We will hold contact details for suppliers to The UK Sponsorship Awards Ltd.
We assert that the content on The UK Sponsorship Awards website and within The UK Sponsorship Newsletter is of direct relevance to those working in the sponsorship, brand partnership and brand activation sectors. We believe the information we provide keeps the sector updated on the Awards and provides the industry at large with ideas and opportunities which could be of assistance with its business activities. We believe that we have a legitimate interest in continuing our correspondence with our database. However, all contacts on the database can opt out at any time and can do so each time a mailing is addressed to them. Once unsubscribed, they cannot be re-contacted unless they actively choose to resubscribe. Please do not hesitate to contact us should you require any further clarification.